Home Lifestyle	How Do You Want Your Life to Change in 2017? How Do You Want Your Life to Change in 2017? Every year, around this time, I start thinking about how I want my life to look next holiday season. This has been a particularly challenging year for a lot of us. So, I’m determined to make sure my life changes in a big way over the next 12 months. A big way for the better! This isn’t so much a new year’s resolutions thing. Mostly because I know I always over estimate my commitment to any resolution I make around this time of year. I start strongly and, fade quickly. Instead of trying to be the hare, this year I’m going to be the tortoise. Mostly because I know I always over estimate my commitment to any resolution I make around this time of year. I start strongly and, fade quickly. Instead of trying to be the hare, this year I’m going to be the tortoise. That means focusing on progress, not speed or perfection. It also means, being less rigid about how things happen and more certain about why I want them to. If I don’t have a clear ‘why’, I know all the ‘how’s’ in the world won’t help. 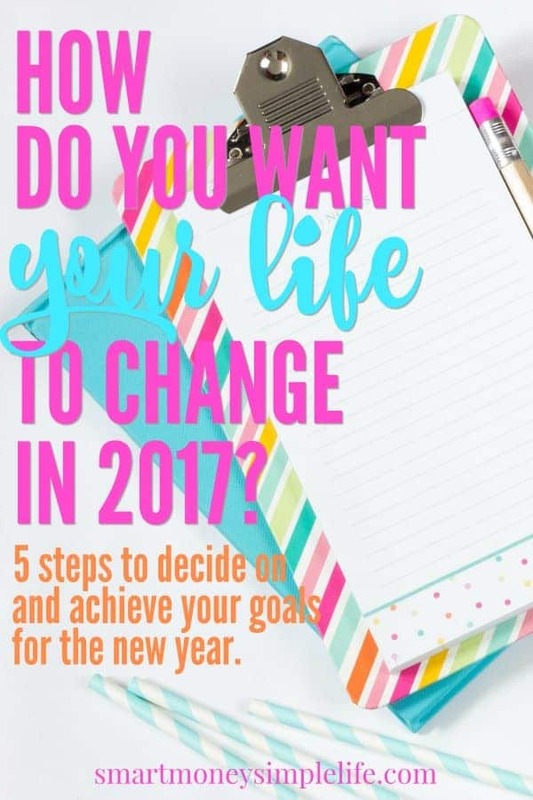 Do you want to change your life in 2017? If you’re keen to do the same, join me in going through these five exercises to make sure those changes happen. It’s easy to get so caught up in daily life you don’t have the chance to stop and think about whether you’re living the way you really want to live. The next chore or task is all you can see. Find some time to disconnect from the world for a little while. Turn off the TV. Shut down Facebook. If you’re in the car, turn off the radio and just give yourself some time to think: How would you like your life to change? What would your best life look like? Feel like? If you’ve had a dream you’ve buried away, dig it out again. Does it still resonate with you? Let yourself visualise what your life could be like. And, then accept that it CAN be like that if that’s what you really want for yourself. Then, write those dreams down. For the next 21 days, read over your goals morning and night. Do they still sing to you? This is where you get the chance to see which goals are really important to you and you feel a sense of urgency to achieve in the next year. Some of the dreams you’ve identified might need a little longer to achieve. That’s OK. Remember it’s about progress, not speed or perfection. Plus, you only have 24 hours in a day. You might not have time for everything on your list. Revisiting your goals for 21 days will allow your subconscious to filter out the less important goals. The other important aspect of revisiting your goals for 21 days is to find out what’s possibly blocking you in achieving those goals. Listen to your self-talk as you review your goals. What are you telling yourself? If your chatter is negative, you might need to work on some positive affirmations. Make your goals specific and positive. Focus on abundance, not scarcity. For example, instead of saying I want to get out of debt so I’ll spend less, focus your goal on earning more money and using the extra money wisely. Use the same approach for all your goals. If you want to lose weight, try adding healthy meals and exercise to your lifestyle not eating less. Focus on the thing you want more of in your life: more money, more health, more happiness. Once you’ve settled on how you want your life to change in the coming year, you need to map out your plan. If you want to be thinner, fitter and healthier; figure out how you can add more healthy meals to your menu plan, more activity into your day and if there are any other healthy habits you could adopt. Like, getting more sleep or drinking more water. If you want to earn more money, can you get more hours or a pay rise in your current position or is it time to consider a side hustle? Can you achieve your goals by using what you earn now more wisely? If you want to finally write that best-selling fiction series that’s been percolating away in your imagination for years; allocate the time to do it. And a deadline for the first draft. If you’re not sure how to get started then work backward from your goal. Outline each step you would have taken to get to that point. How did you get your ticket? Can you save that much in a year? How long will it take to travel to your destination? Will it be worth it for a one week holiday or should you stay longer? What’s the accommodation like and how much does it cost? Once you start working backward you can be sure you’ll cover everything you need to in your plan to get there. Remember it’s about progress, not perfection. Also, be mindful that sometimes fear and discomfort are a natural part of pushing through your comfort zone. Accept their presence and keep moving toward your goal. But… There’s no point in setting goals with the intention of changing your life for the better if they just cause stress and anxiety so be flexible. You never know what’s going to come up during the year that might interfere with your goals. Any number of external factors can disrupt your plans. I learned that this year. Review your progress regularly and be realistic if something you never expected does come out of left field or you find your priorities have shifted. The idea is to change your life for the better, not zip yourself into a straightjacket! Sometimes you need to dig your heels in and other times you need to go with the flow. The trick is figuring out which one is appropriate at the time. Are there some specific changes you want to make over the next 12 months? Have you figured out how you’re going to achieve those goals?